With framing equivalent to a 16-35mm zoom on a full frame body, the Canon EF-S 10-22mm f/3.5-4.5 USM Lens provides EF-S compatible camera body owners with the ultra-wide angle focal lengths so often missed on this small-sensor format camera. 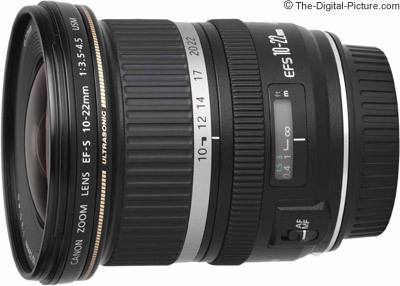 EF-S is Canon's moniker for Small Image Circle. The distance between the film (sensor) plane and the rear of the lens is shorter than it is in an EF lens. Many have questioned the longevity of this standard, but, my expectation is that it will be around for a long time - easily long enough for most people to get their desired value from a lens. That is a palomino quarter horse bathed in sweet light from the setting sun. 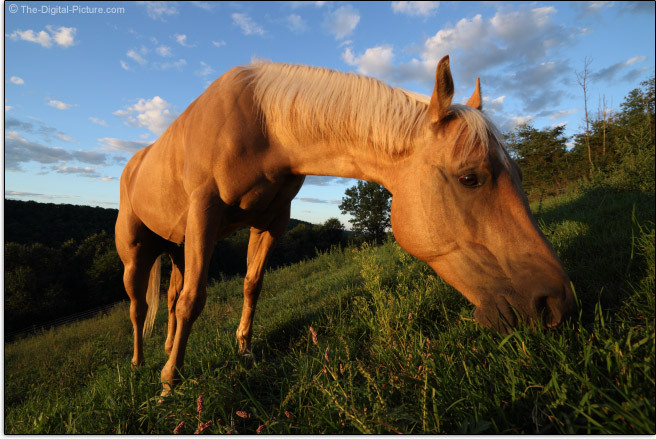 The horse is doing what it does best - grazing. This 10mm capture was made with a Canon EOS 70D. Since the ultra wide angle focal lengths are one of the most-desired features of the Canon EF-S 10-22mm f/3.5-4.5 USM Lens, let's take a look at a focal length comparison. At the super-wide 10mm setting, my tripod is barely outside of the frame. At 22mm, the framing is similar to what many general purpose zoom lenses can deliver at their widest focal length - which is likely similar to the 17mm or 22mm examples. Knowing Canon's excellent-at-that-time 16-35 L and 17-40 L lenses had some shortcomings at their wide end (namely strong barrel distortion and soft corners), I was apprehensive about a non-L Canon 10-22mm Lens. Softening my apprehension was knowledge that Canon was including three Aspherical lens elements and a Canon L Lens Series-like Super-UD element. To cut the chase, I must say that I am very impressed by the lack of strong barrel and pincushion distortion in the 10-22. It is not perfect, but very good for this extreme wide angle focal length range. There is some barrel distortion at 10mm moving gradually to a slight pincushion at 22m. Slight enough distortion for me to be happy with the results. The 10-22 is reasonably sharp wide open over the entire focal length range - and more impressively, reasonably sharp right to the corner of the frame. Sharpness improves only slightly when stopped down, but vignetting quickly improves at narrower apertures. Wide open (especially at 10mm), the 10-22 shows strong vignetting. 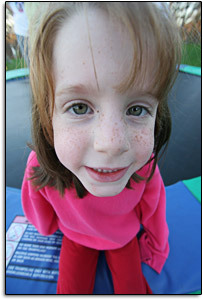 Stopping down or increasing the focal length reduces the vignetting effect. CA (Chromatic Aberration) is a common lens quality differentiator. CA is noticeable in the corners at 10mm, but gradually disappears (or nearly so) by 22mm. Flare is another common enemy of an ultra wide angle lens. A wide front element combined with an ultra wide focal length can spell flare problems when the sun is out. The good news is that the 10-22 controls flare very well. Usually, if the sun is not in the frame, flare does not appear. Bokeh? Well, Canon claims the 10-22 has a circular aperture design for great stopped-down out of focus highlights. Actually getting stopped down out of focus highlights in normal shooting applications is not easy with a lens of this ultra-wide angle range of focal lengths with not-wide open aperture settings. So, a good feature with relatively low importance for most uses for this lens. A very deep depth of field is a welcome feature itself. Build quality of the 10-22 is very nice. It feels reasonably solid and well made, but is not heavy or large. The size and weight make the 10-22 a nice match for the current EF-S mount DSLRs. A metal lens mount rounds out the quality build. As of review time, none of the EF-S lenses are weather sealed. Although the 10-22 does not extend with focusing or zooming, the inner elements move in/out slightly inside the barrel. The 77mm filter size allows filter sharing with many of the other L-zooms. Expect to see a small amount of additional vignetting at 10mm with a wide open aperture when using a standard sized (non-slim) UV filter. Many people don't mind this, but a slim filter avoids the problem. If using a circular polarizer filter, definitely get the slim version. Note that a Circular Polarizer Filter may produce an uneven result at these wide focal lengths - some can be seen in the sample gallery. The 10-22's focus speed is fast and the focus sound is very quiet. We can thank Ring USM (and a short infinity focus distance) for these features. Minimum focus distance is about 9.5" (241mm) for the 10-22. 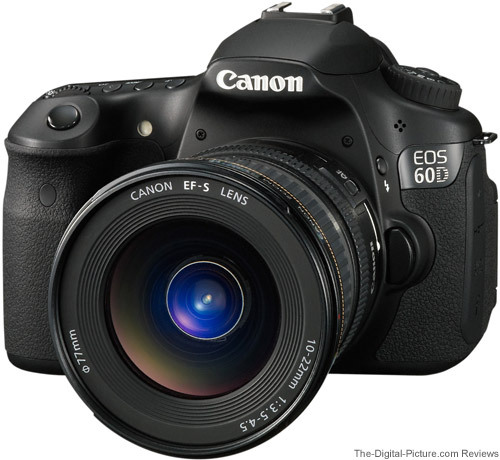 With a maximum aperture that ranges from f/3.5 to f/4.5, the 10-22 is a medium-fast lens. The wide focal lengths make handholding easier. Flash coverage of the 10-22' complete focal length range requires an external flash unit. Even with an external flash, a Sto-Fen Omni-bounce may be required for close work. The 10-22's focal length range fits nicely below Canon's popular 24/28-XXmm general purpose lenses such as the Canon EF 24-70 f/2.8L Lens. These two lenses (or other similar combinations) could satisfy all focal length needs below 70mm for many people. Even if your main lens is 16/17-XXmm, the 10-22mm is much wider and would make a useful addition to your kit. In my opinion, shooting at 10mm requires more skill on the part of the photographer than shooting with longer lenses. 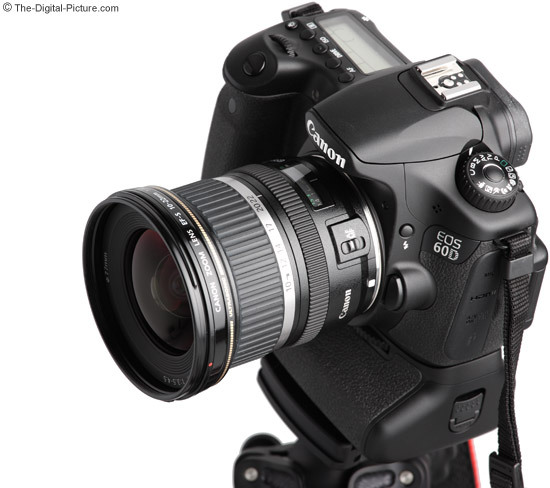 The 10-22 is even wider than the Canon EF 15mm Fisheye Lens on the same camera. Composition at this focal length becomes more difficult. As this angle of view takes in a lot of background, care must be taken to make it look good - it probably will not be blurred out of focus. Watch out for your shoes and shadow - they are easy to include in the 5% of the picture missing from the current EF-S DSLR's 95% viewfinders. Close-up perspective at 10mm can result in wild and dramatic photos. This angle of view opens up a great opportunity for creativity. But if you want parallel lines to remain that way, you must shoot them from an exactly perpendicular angle (or fix them later during post-processing). This perspective distortion is up to photographer to control or dramatize as desired. Architectural photography is one 10-22mm use with many parallel lines. Interior photography is another similar good use for this lens. While there is no law against taking pictures of people with the 10-22, they better be self-secure, fun-loving and smaller than you if they are going to see the results from close shots! You can make monsters out of your angels. Everything that sticks out will be greatly enlarged - especially noses. Fortunately, Brittany fits my 10-22mm people subject criteria. On a more serious note, wide environmental portraits and other people pictures taken from a longer distance can yield fine results. 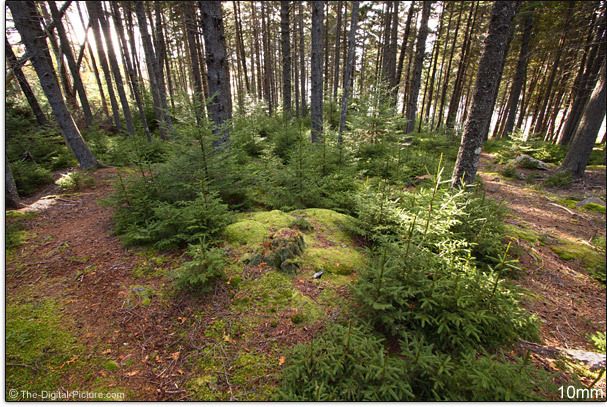 Click on the image below to see an on-camera comparison with 5 other similar lenses. 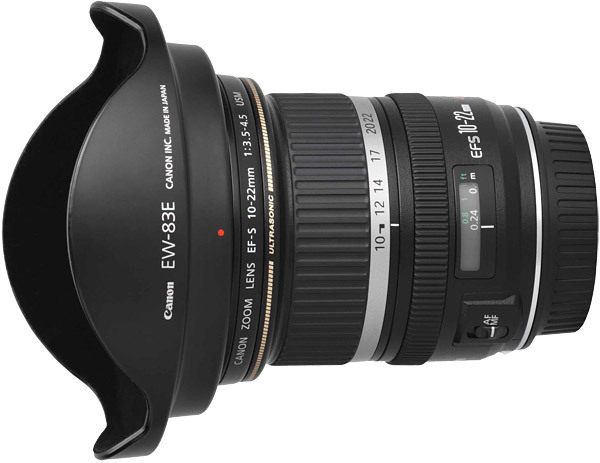 In summary, I think the Canon EF-S 10-22mm f/3.5-4.5 USM Lens is a great addition to the Canon lens lineup. This lens is an ideal 2nd or 3rd lens for most photographers. I just wish I could use it on my full-frame DSLR bodies.